Chiral molecules are characterized by a unique three-dimensional handedness, and the resulting pairs of left- and right-handed enantiomers often exhibit distinct chemical activities when reacting within a chiral environment. Enantiomeric pairs of chiral molecules also exhibit distinct responses to left- and right-circularly polarized light in absorption, refraction, and scattering. These responses may be used to determine the handedness (i.e., the "absolute configuration") of an enantiomerically pure sample, provided sufficient details about the corresponding circular dichroism, birefringence, or scattering intensity differences are known a priori. 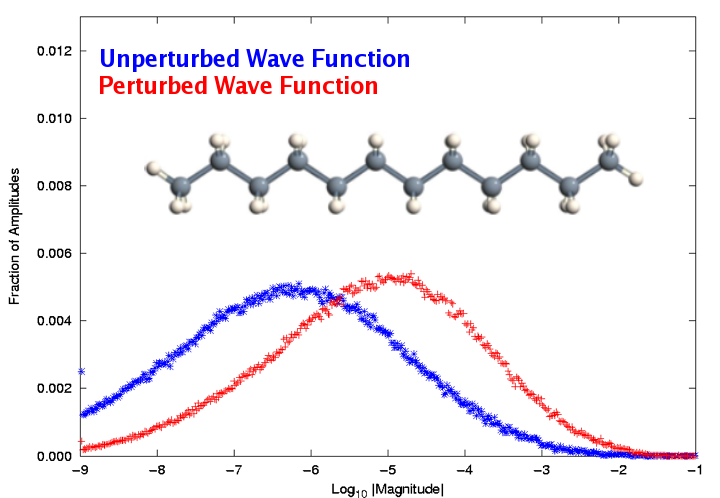 The structure (left) and optical rotatory dispersion spectrum (right) of the helical molecule, (P)--triangulane. One of the major goals of our research group is the development of high-level ab initioquantum chemical models for prediction of molecular chiroptical properties such as specific rotation angles and CD spectra. Over the past several years, we have developed an efficient implementation of the coupled-cluster singles and double (CCSD) linear-response model that is applicable to medium-sized molecules such as triangulane. These models are available as part of the PSI3 suite of quantum chemical programs. The coupled cluster method is widely regarded as the "gold standard" of quantum chemical models because of the high accuracy it often provides for a variety of molecular properties, including structures, thermodynamic constants, and vibrational spectra. However, conventional coupled cluster theory suffers from high-degree polynomial scaling with the size of the molecular system (as measured by the number of electrons and the size of the one-electron basis set). 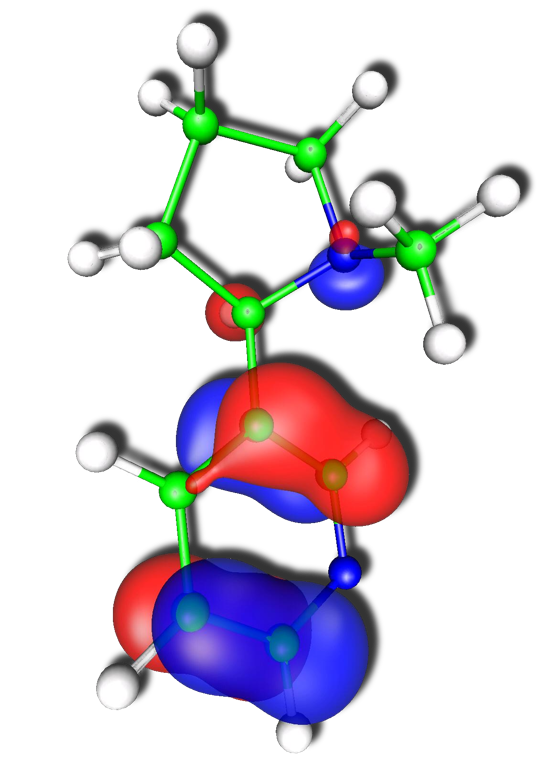 The CCSD model, for example, scales as the sixth power of the molecular size, which implies that doubling the size of the molecule increases the computational time by a factor of 26 = 64. Even with state-of-the-art computing facilities, this scaling precludes application of coupled cluster theory to non-symmetric molecules larger than 10-12 heavy atoms. Local correlation, a concept pioneered by Pulay and Saebø, provides one possible route over the scaling wall through a judicious choice of molecular orbital basis. The "canonical" MO's, although convenient, are often delocalized over the entire molecular framework and often lead to overestimation of electronic interactions on spatially distant atoms. Pulay and Saebø demonstrated that if one abandons canonical orbitals and instead chooses a more localized form, vast numbers of electronic wave-function parameters become negligible and may thus be ignored. Left: Contour representation of the delocalized highest-occupied molecular orbital of (R)-3-(1-Methyl-2-pyrrolidinyl) pyridine, also known as nicotine. Right: Distribution of the wave function amplitudes of dodecane by order of magnitude for both unperturbed and electric-field-perturbed wave functions. The sparsity of the perturbed wave function is reduced relative to the unperturbed state by more than an order of magnitude. However, the application of the localization concept to molecular response properties introduces an additional complication: accurate representation of the derivative of the wave function with respect to an external perturbation, such as an electric or magnetic field, requires a more accurate representation of the unperturbed wave function than is necessary for computing the energy alone. Thus, the usual "orbital domain" structure that has performed so admirably for locally correlated ground-state energy calculations fails when applied to response properties. To compensate, we have devised a new domain construction approach based on analysis of the response of the individual molecular orbitals to the relevant external fields. This approach has proven successful for simple dipole polarizabilities, and work is underway to extend it to mixed electric/magnetic properties, such as optical rotation.